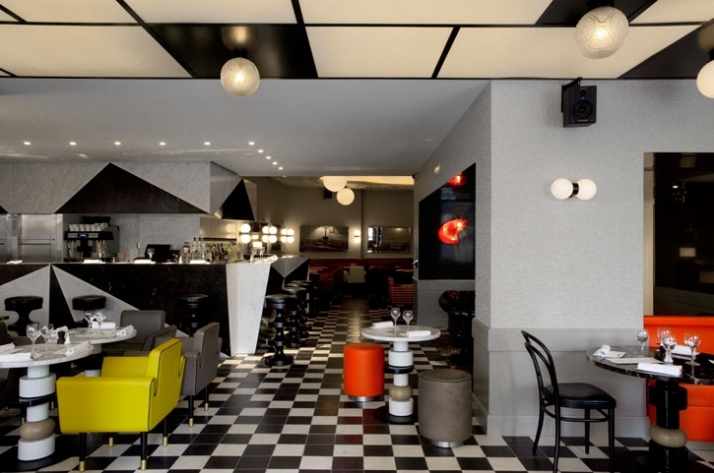 Perpendicular to the Boulevard St Germain, located at 25/27 of the charming rue de Buci, there is now an additional dining option for the selective Parisians, and not only, under the name Germain. 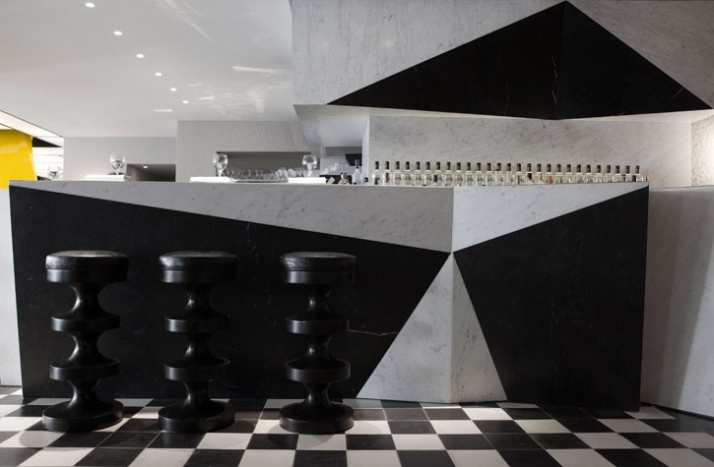 Opened by Thierry Costes, a connoisseur of resto-business activities and run successfully since May 2009 alongside other restaurants and cafes owned by the Costes brothers, the Café Germain offers an alternative to the traditional Parisian brasserie. Previously being the well-known restaurant of the 80’s L’Arbuci, the café Germain offers today to its customers a mix of different elements and influences both in terms of its atmosphere and cuisine. The restaurant is spread into two floors whereas each of them serves a different function. One of the strong points of the venue is its distinctive decoration which reminisces to the visitor the times of the past. 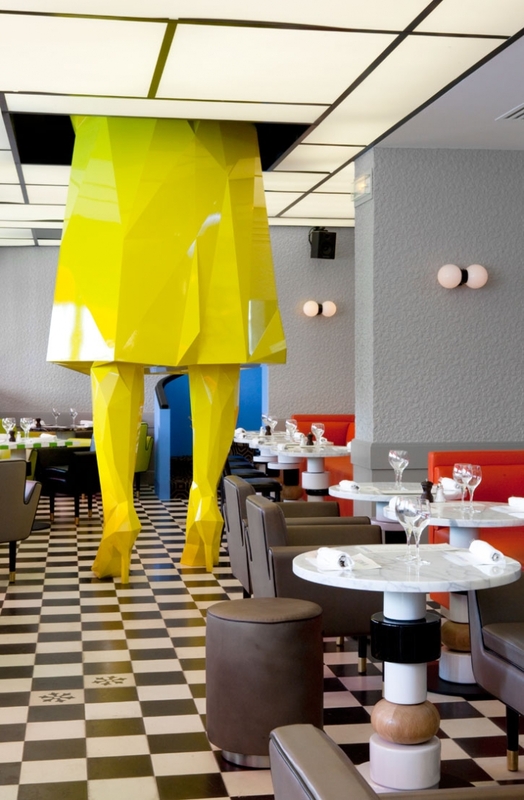 What India Mahdavi aimed, the Iranian-born and Paris-based architect in charge of the interior design of Germain, was to create a different style in each of the restaurant’s rooms. 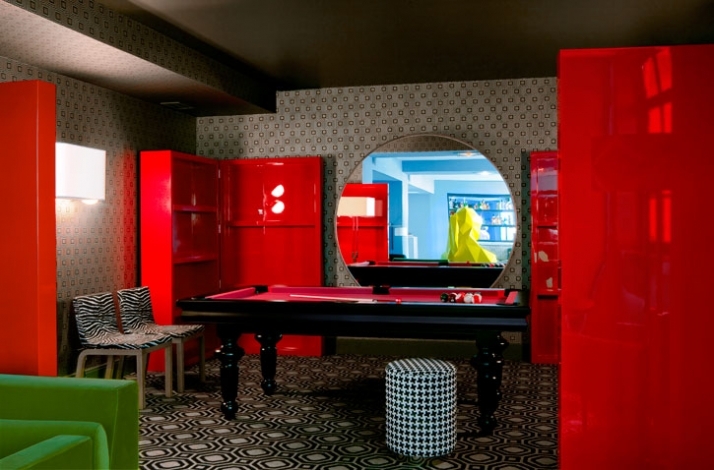 The result is two different rooms, largely different from each other in their moods yet very consistent. 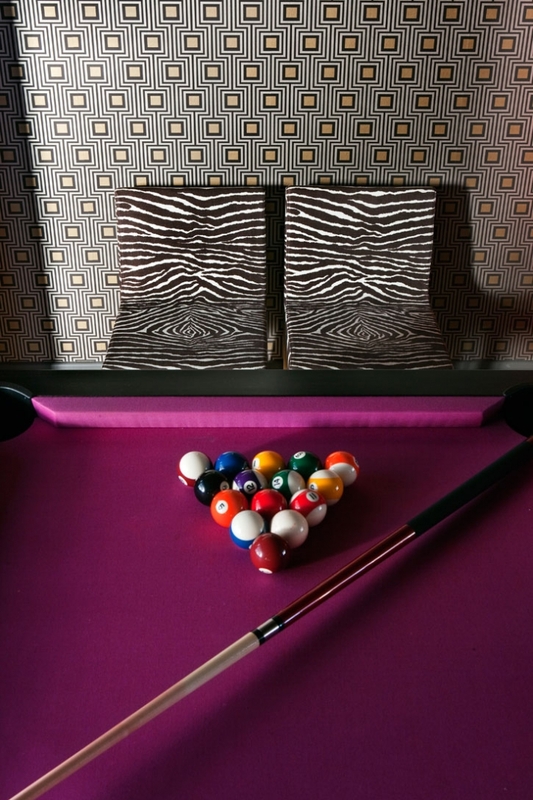 Principal elements of its decoration include check board patterns, leopard prints, big leather sofas, stool bishops and various crystal details. 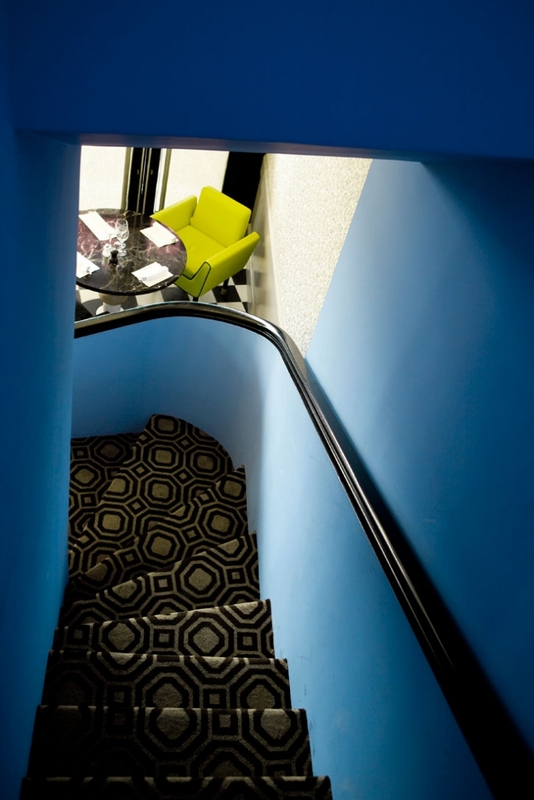 The ground floor functions as the main ‘salon’ of the venue, and is where the restaurant and bar of the venue can be found. 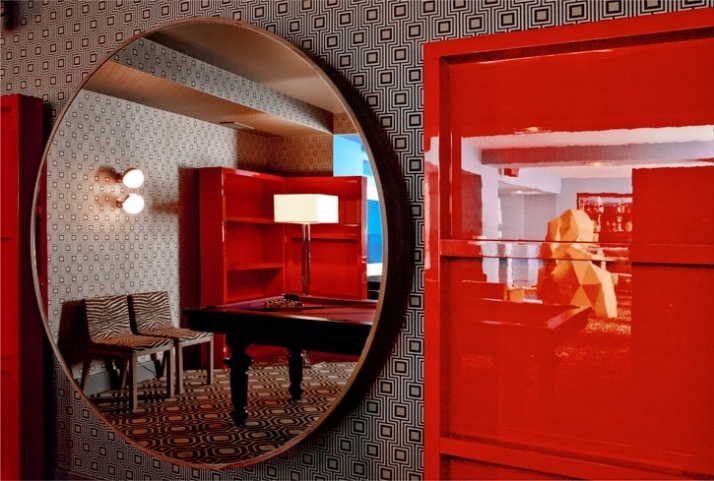 At a first glance the interior of the ground floor becomes reminiscent of the past conveying to you a 70’s mood. 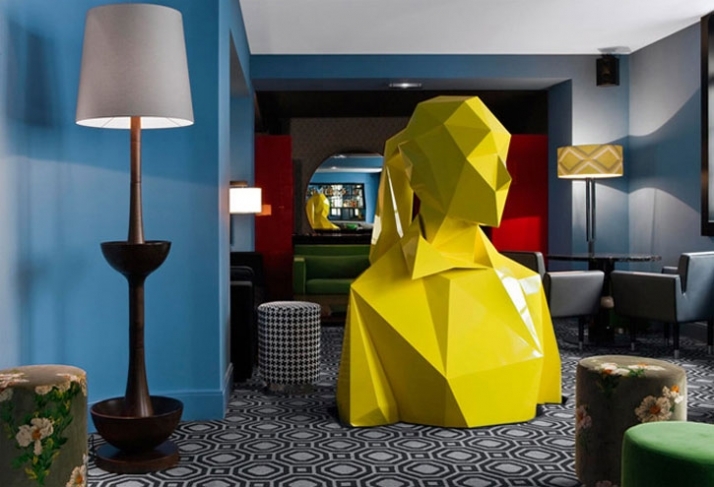 Vibrant colors, mainly reds and yellows often accompanied by contrary blacks, vector patterns on the furniture and carpets and a full surface black-white check board-patterned floor makes you feel as if you are in a retro dining room of the 1970’s era. On the other hand, the private salon on the first floor, designated for private parties and gatherings is thought to be a decorative achievement. The large, comfy sofas and the big rotunda-dining tables accompanied by a stylish pool-table serve adequately their purpose of creating an atmospheric but at the same time functional area. 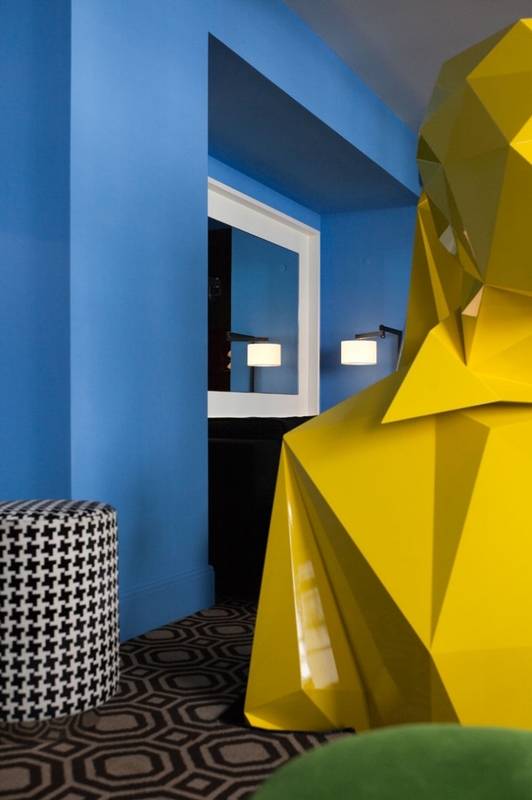 One could say that the most unique aspect of the restaurant Germain is the massive, yellow sculpture created by the renowned French artist Xavier Veilhan, currently showcasing in the Chateau des Versailles in France. The sculpture is entitled "Sophie" and it's spread across the two floors of the restaurant, whereas in spite of its boldness and modernity yet it matches perfectly with the general decorative mood of the restaurant. 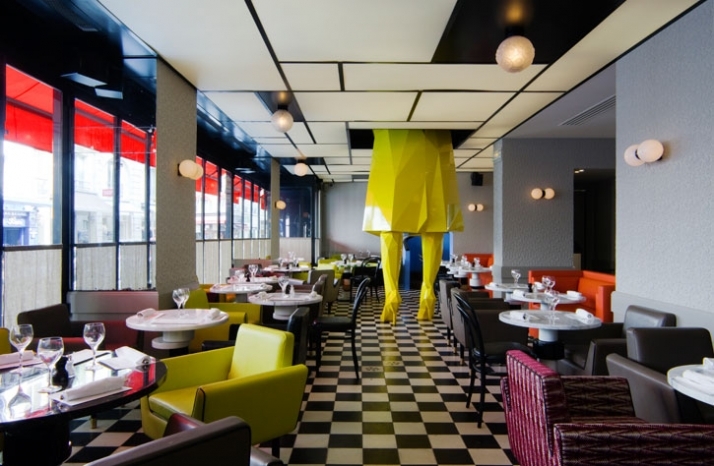 "Sophie" embodies a woman’s figure in an overcoat and heels, whereas its lower half stands on the restaurant’s ground floor while the upper body and head break through the ceiling and appear in the upper, lounge area. This surely constitutes a vocal point of the identity of the restaurant since it adds to its status and glamour but also acts as a distinctive characteristic. In 2006, I made a portrait of my friend Sophie for my personal exhibition at the Emmanuel Perrotin Gallery (Miami). Three large statues of Sophie stood alone in the gallery space: each offered a particular definition. 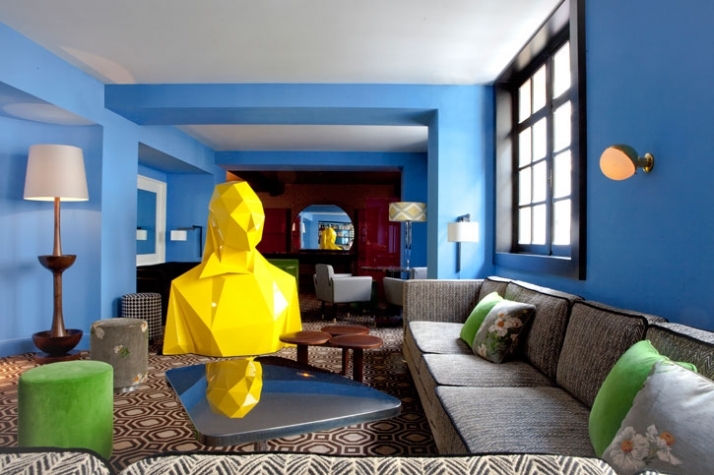 When Thierry Costes proposed that I contribute to the space drawn by India Mahdavi, he referred to pieces that I had already produced. But while visiting the restaurant's construction site, spanning three floors, I realized that a vertical opening would be more spectacular and do the space more justice, as if the sculpture was pre-existent. Regarding the cuisine of Germain it is said to be traditional French with some further ‘touches’ as for example the fish and chips with tartar sauce dish or the Californian salad proudly recommended by the personnel. 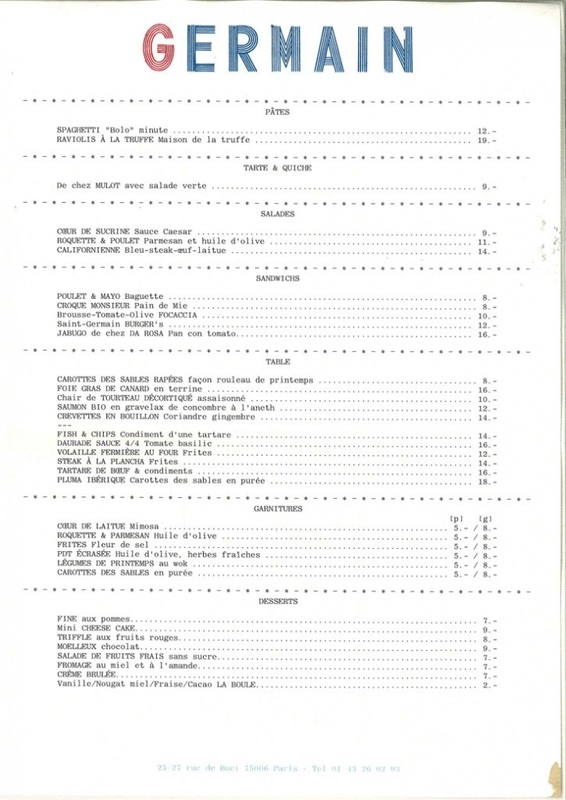 As far as the cost is concerned, prices range from €30-45 a la carte, which is regarded as a medium-cost restaurant for the Paris standards. Of course everything depends on personal opinions and tastes. Therefore, if your way leads you to the chic left bank of Paris, just pop-in and make your own conclusions. 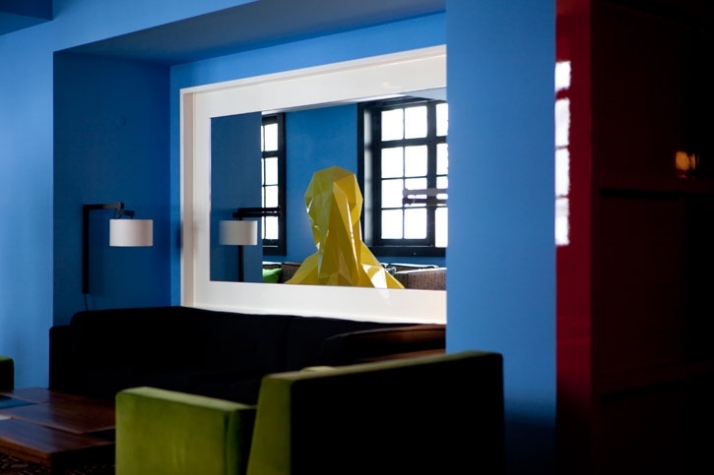 Besides all, a trendy restaurant carrying a worth-seeing piece of art is something that does not happen everyday.